The first derby clash between the Broncos and Crushers proved a sobering affair for the new boys on the block in front of a crowd of 49,607 at Brisbane’s ANZ Stadium. The Brisbane Broncos, who had won two premierships since their admission to the then NSWRL in 1988, scored six tries (two by winger, Michael Hancock) in their 32-0 defeat of the South Queensland Crushers, new boys on the block in the expanded 1995 ARL competition. The match was played against the backdrop of the ‘Super League’ war, with Brisbane aligning itself with the rebel News Ltd backed organisation, while the Crushers, backed by the Queensland Rugby League, stayed loyal to the ARL. Brisbane led 12-0 at halftime, and a try to Darren Smith soon after the resumption ended any chances of a Crushers’ comeback. 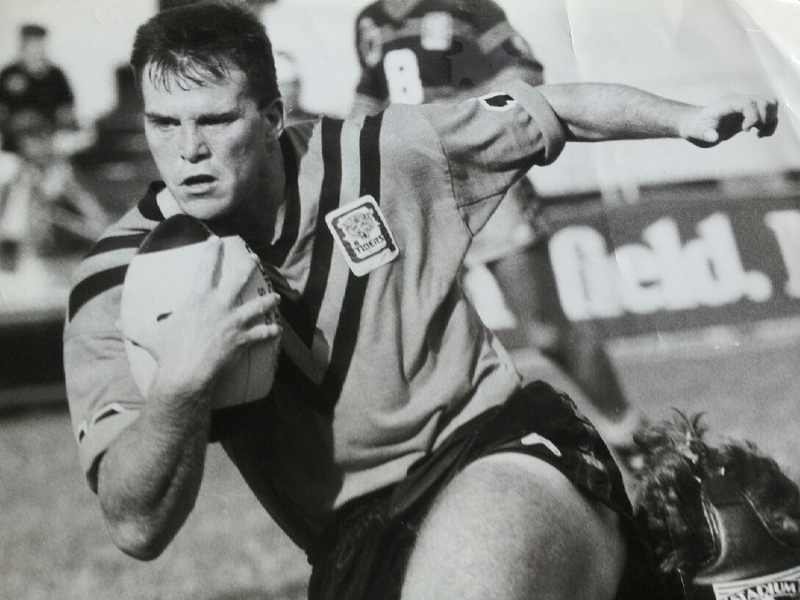 Smith, who had initially agreed to terms with the Crushers, crossed after halfback, Allan Langer had stepped past the Crushers’ British Test halfback, Mike Ford. When I interviewed Smith for the book ‘Bennett’s Broncos’ in 2013, he told me his solicitor made sure there were certain conditions in the Crushers’ contract, which had to be met. A week before the match, Crushers’ coach, Bob Lindner had stripped Sydney import, Mario Fenech of the captaincy, giving the reins to Queensland legend, Trevor Gillmeister. Fenech was retained in the top squad, but it wasn’t until the 50th minute he was used off the bench against the Broncos. Gillmeister was penalised twice for high shots against the Broncos, the first on young Broncos’ forward, Brad Thorn, a good effort considering Thorn is twice as tall. Giant former Wallaby, Garrick Morgan had an absorbing duel with Broncos’ league Test stalwart, Glenn Lazarus, who played like a man possessed, and was named Channel 9 man of the match. Morgan wasn’t as destructive as ‘Lazo’, but he was willing and always on the ball. Earlier that week Morgan was forced to deny suggestions he would return to rugby union because the Crushers were not up to date with contract payments. In more recent times Morgan revealed he had discussed a switch back to the 15 man code, but was determined to make a success of league, the game his father, John Morgan had played with distinction for Manly, New South Wales and Australia. The Broncos and Crushers met in four grades on that April day in 1995, with the Crushers winning the Brisbane first grade match and drawing the ARL reserve grade encounter, while the colts lost narrowly to eventual premiers, Brisbane in the XXXX under-19s. “That’s where our future lies,” said Crushers’ CEO, Darryl Van de Velde of the club’s efforts in the lower grades. Broncos’ coach, Wayne Bennett was not so optimistic about the Crushers’ chances. The Crushers would last only three seasons. In 1995 they couldn’t even train on their home fields at Corbett Park, Grange in Brisbane’s north because a small number of local residents had appealed against a council decision to change the zoning of the fields allowing junior football to be played there, as it had been in the past. For many years Corbett Park had been home to the Past Brothers Rugby League club.